Hello all, in my other post about the pack finals race, I discovered I have an issue in my plan. In discussing it, I came up with another idea I wanted to ask about. I expect 30 kids total at my derby, and we award 4 trophies per den. The top 4 in each den also advance to the pack finals. What that means is that 2/3rd of the kids advance to the pack finals. If we're going to advance almost all the kids to the finals, would it be dumb to just invite ALL the kids (who want to) to the finals? In either case, I've learned that it'd be best to run a preliminary race to find the top 7, then run a perfect-N (3-lane) chart to award the trophies. If I run a big group of 30 kids, is a PPN chart a good way to find the top 7, or is there some other method that would be good? I've read a bunch about lots of race formats, but this is the first time I've considered a group that large. Time efficiency is a concern. I think i would maybe go to top 3 instead if you think your finalist pool is too big or maybe go 3 rounds. No, I'm not saying my pack finals pool is too large. I need the top four from each den to advance, for the sake of accuracy. I don't want to advance only 3, because I'm awarding four trophies. There's a chance that the four fastest kids in the whole pack are all bears, so only advancing three bears introduces error. I'm just saying, if we're going to race 20, why not all 30? More racing for the kids! If you have time, do it! Don't call it "finals" ... just "king of the hill" or some such! Every one gets more racing! How can that be bad? I think I like this better than the other plan. One curiosity you might find is which cars have "staying power." Most will easily go 12 heats without seriously degrading their lube, and some will go more. Think whether you want to give 'em a "relube" time between. I'd not, but it is your choice. Can anyone think of a reason why anyone would feel cheated? I don't see any real situation in which a someone would miss out on a pack trophy due to inviting more participants into the pack race. Well, maybe just one. Let's say, for instance, the bear den is dominant. The top 4 bears win all 4 pack trophies. If we invited the 5th place bear into pack race, he might edge out the 4th place finisher and get a trophy. But still, he was faster, and should get a trophy. I got some feedback from some of my other leaders that this is a bad idea. They see advancing to the pack "finals" as a privilege, and liken opening the pack race to everyone to giving everyone a trophy. That was something I hadn't thought of, and their objection is firm enough that we won't be doing it. korey99 wrote: I got some feedback from some of my other leaders that this is a bad idea. They see advancing to the pack "finals" as a privilege, and liken opening the pack race to everyone to giving everyone a trophy. That was something I hadn't thought of, and their objection is firm enough that we won't be doing it. If you call it a "Finals", then I agree with the leaders. However, if you call it a "King of the Hill" or, better, a "Whole Pack Race", then I call it "giving all of the Scouts more racing!" I'm for "more racing for everyone." More than likely, the den trophy winners will gather all of the Pack Race trophies. There are some possible exceptions, though. A scout may have had one or two poorly staged heats. A scout may have more level graphite degradation curve. Or the scout just may have learned something about staging during those first heats! I suggest giving the kids something to do on the side so those that don't want to watch are out of the way from the ones that do. 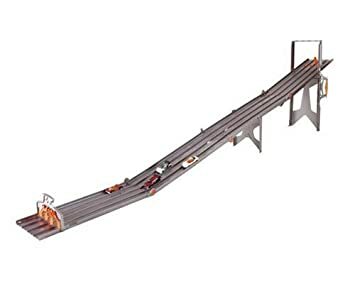 My son has one of these that we plan to bring and tell all the scouts to bring their favorite hotwheels car as well. We will have a bucket of other cars just in case. It is a 4 lane track with a simple finish line system. Holy smokes! Didn't realize these aren't made anymore and how valuable these things are now. It is a miracle we haven't broken ours. Still cheaper then trying to get the lego brick derby kits and a plastic track.